Having a father that worked for a company, that kept moving the family around, created a nomadic childhood for Daryl. In 12 years of public school he was bounced around to 8 different educational institutions. This forced him to learn to react quickly to new environments...perfect training for a stand-up comic in the making. Despite all the moving Daryl managed to maintain an "A" student status even if it meant being the new kid and nerd. He quickly learned that being a class clown kept the bullies from beating up the new kid. This ability was a gift that seemed to come natural for him so it only seemed fitting he would end up in the world of stand-up comedy. His mother Doreen was his biggest inspiration for all things being funny. Fast-forward many years and Daryl Makk is re-educating the sheeple of the world...one joke at a time and has been since 1993! He has also grown to a comedian that doesn't hold back.On stage his humor he delivers with precision yet in a very likeable manner!! Makk understands that comedy can educate and inform and bases his act on truth, reality and things he has experienced. While some of his bits may seem like fiction keep in mind they are based on real events. He is often booked for corporate and fund raising events when not in the comedy clubs. With an easy-going style he awakens those nagging thoughts we all have about how screwed up the world around us really is. Think of him as the little voice in your head trying to scream out! 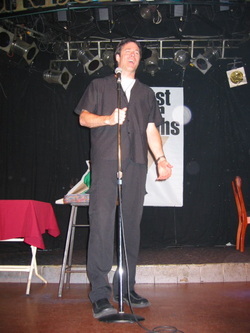 in 2005 his one-hour "Comedy Now" special was chosen to kick off season 8 of this award winning show. It aired on CTV and is in reruns on The Comedy Network. Daryl is currently working on a book of short stories based on his on road adventures. Daryl Makk is out to tickle the funny bone of the planet and promote road safety. One comic, his motorcycle and one big planet!